One of the most interesting new games to emerge from Gamescom 2017 so far is Biomutant, which sprung from nowhere with a colourful and intriguing trailer. Turns out it’s been in development since 2015 and is pretty far along now. Thanks to an IGN livestream with Stefan Ljungqvist, head of developers Experiment 101, we just learned a lot about how it’ll play. For all the latest from the show, follow our Gamescom 2017 tag. The trailer we saw shows the main protagonist “before you do your own version of him,” and we’re then shown the character creator. There are a few standard RPG stats, such as strength, vitality, intellect, agility, and ‘other’, as well as lots of scope for colouring and patterning your fur. We also hear that adjusting the critter’s size will have a gameplay impact – get bigger, and you’ll gain health, but lose speed. Interestingly, your eye patch is involved in the narrative, so can’t be fixed. 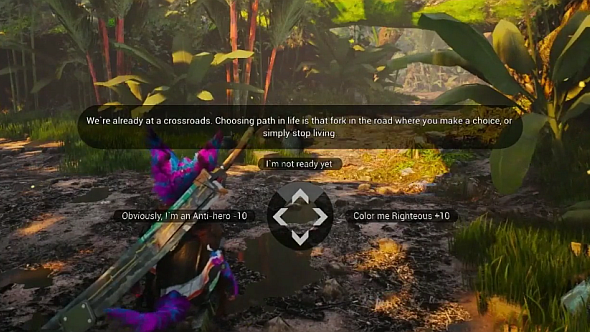 When you’re finished, you’ll walk your character through a few forking paths to determine their alignment on a yin- and yang-based “karma system.” This will affect questlines that open up, dialogue choices, and character interactions – for example,the game has six tribes with differing aesthetics, behaviours, agendas, and moral alignments. If you choose to help one out, and your alignments, er,align,then their boss might teach you new moves. After your first meeting (and fight) with the world’s last remaining meat eater – a recurring character who you’ll meet several times, and holds part of the key to who you are – you’re free to explore the game’s open world. You can go anywhere in the world’s 4×4 km diamond, but it’s divided into biomes, and deeper exploration into those biomes is gated – you’ll need warm clothes to go past a certain part of the cold zone, for instance, and you’ll need to work with another character to build a “wotski” to explore the archipelago near your starting location. Another vehicle is a pilotable hand. Literally, a giant walking hand – we hate to think what kind of biome that’s needed to cross. 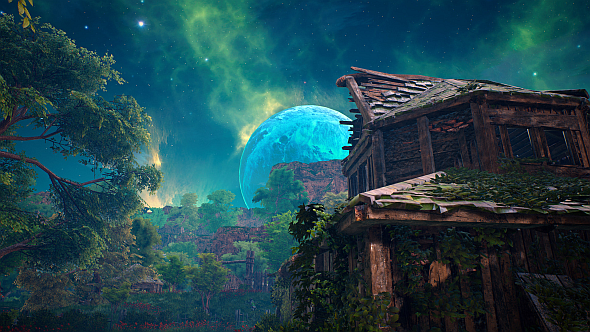 There’s also a matching underworld, which sounds like it could tie into the story in various intriguing ways: Biomutant is set in a post-apocalypse, but not one of the nuclear or zombie varieties. The apocalypse here concerns a biological goop that’s seeping through the crust of the earth, contaminating the planet and poisoning the Tree of Life. Could it be seeping up from the underworld? The biogoop spawns some of the monsters you’ll fight – you’ll need to kill them for bio points, which you’ll spend to unlock and upgrade your physical, biological mutations. Speaking of combat, Ljungqvist says “we wanted to create a unique combat system, where you’re freely flowing between melee, martial arts, and shooting.” Inspiration was taken from John Woo’s kung fu movies, so expect some aerial shooting acrobatics and the odd bit of slow-mo. That’s not to say it’ll rely on scripted moments or QTEs – Ljungqvist wants the combat to be pacy and personal, so don’t expect much in the way of cover, either. Also, ‘Wham!’ and ‘Pow!’ text pops up in the middle of combat, so that’s fun. Accompanying you through your travels is the grasshopper you may have noticed in the trailer, who’s your sidekick, of sorts. It’ll contextually react to stuff in the world, and give you backstory and new quests. You can expect to meet plenty of other quirky characters, each of whom will give you a reward that’ll help you explore or fight, if you choose to help them. Expect interactions with some of them to be limited according to the karma system. 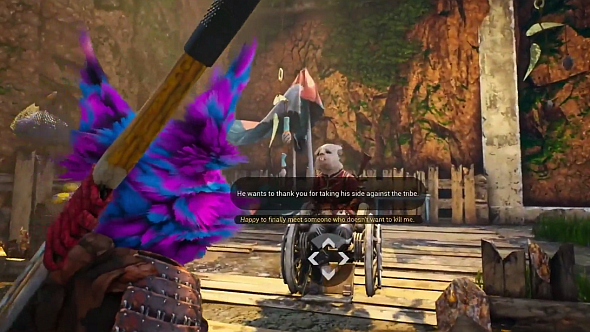 You can listen to Ljungqvist talk it all through, while watching some actual gameplay, at IGN’s stream here.Biomutant starts at 2:31:50. 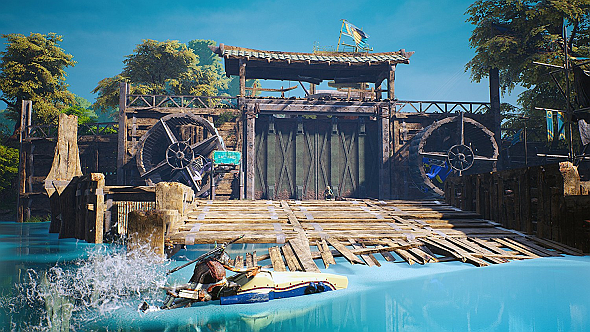 For more on Biomutant, check out the Steam page here. It’s due for release sometime next year.